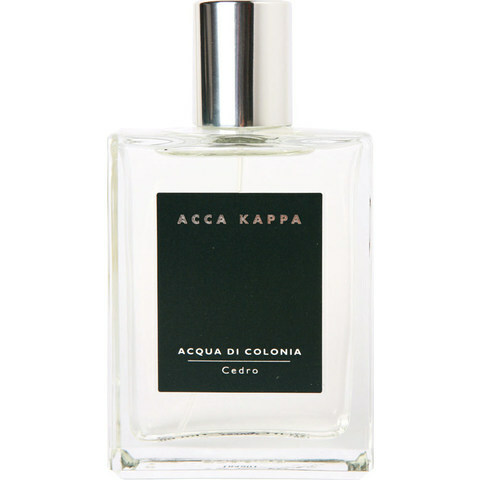 Cedro (Eau de Cologne) is a perfume by Acca Kappa for men and was released in 1999. The scent is woody-spicy. The production was apparently discontinued. In 2011 Cedro was replaced by LiboCedro which can be regarded as a reformulated version of Cedro. Many reformulations go unnoticed. We are not told – as if the responsibles wanted to hide a guilty consciousness. Those who do not follow the general rule are confronted with bewilderment and indignation. Such seems to be the case with Acca Kappa's Cedro rsp. LiboCedro. Cedro is the vintage fragrance and LiboCedro the reformulated version. The whole branch is completely unable to cope with the situation that a perfume house deliberately revealed a reformulation by a slight name change. They simply ignore it. In the shops, sales assistants will tell you that LiboCedro is a complete unique fragrance. And on the net, you can find offers for “Cedro” but with the flacon of “LiboCedro” displayed. No perfume afficionado is fond of reformulation. At least, the sincerity of the Acca Kappa management has to be acknowledged. As usual, the vintage version is the better perfume. Nevertheless, I still recommend a sample wear of LiboCedro. The difference is that between a brilliant and a very good perfume. Acca Kappa is one of those perfume houses that have found a style of their own. All their fragrances are about light musks in the base with more variation in the top and heart notes. Although they divide their line-up into ladies', gents' and unisex perfumes, the focus on light musks seems to make each of their gents' fragrances a good wear for women as well. Each one – except Cedro! Cedro has dry, slightly tart and in my perception very masculine notes of cedar and clove – quite clear-cut. They are put in position against an attractive old-school washing powder musk. This combination is downright thrilling, and I am not aware of any other perfume where this idea is conducted with the same straightforwardness. The tension this creates might lead up to a point where Cedro can become a difficult wear – and the thrill might get disturbing. I can confront myself with that outstanding fragrance only once in a while, the inner tension is simply too much for daily wear. The dry cedar-clove combination gives me images of a gent's club or a smoking parlour while the musk pushes the fragrance into a clean and more modern direction: presumably a weird combination for the less open-minded. On my own, this tension lasts throughout the whole wear. But recently, I had the chance to smell Cedro on a friend of mine. He stayed at my place and in the morning he grabbed into my collection and happened to to draw out Cedro. I smelled him on a car ride in the afternoon and it was all aromatic musks – which was equally attractive. It seems that the two sides of Cedro have a different sillage. Now to LiboCedro. It is almost the same except for a slight hint of what seems to be a little white musk added. This provides a little fluffiness to the fragrance which works like a bumper between those opposing accords. Completely unnecessary! It diminishes the masculine cedar and clove accord and provides a slight unisex touch to the fragrance. I suppose this was what was intended but the thrill and the uniqueness are somewhat – well, moderated. No matter which version – I highly recommend getting to know this special Acca Kappa approach. Write the first Review for Cedro (Eau de Cologne)!